In the poem sequence Darger:his girls Julie Chevalier offers a multidimensional portrait of the life of Henry Darger – ‘Artist and Protector of Girls’ as inscribed on his gravestone. Darger, born in 1892, died in 1973, lived in Chicago. He was a reclusive man who worked all his adult life in Catholic hospitals, mainly as a cleaner. He is famous for his artworks – illustrations in an epic fiction totalling some 15,000 pages, entitled The Story of the Vivian Girls in What is Known as the Realms of the Unreal. Darger’s vast collection of writings and artworks was discovered in his lodgings after he went into the care of the poorhouse nuns not long before his death. Darger’s preoccupation with children, especially young girls, has brought him into the forensic spotlight especially via the explorations of the psychologist John M MacGregor. 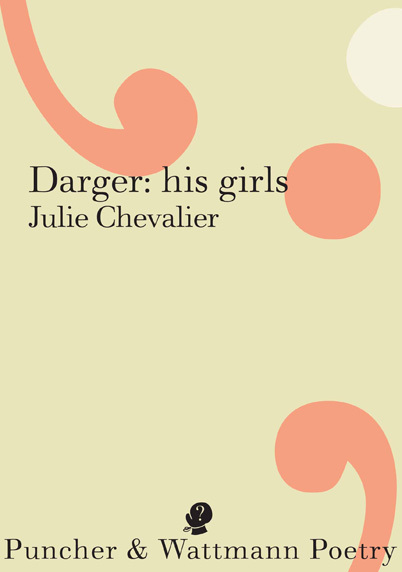 Chevalier provides a lucid introductory essay prefacing the poem sequence which discusses various issues regarding Darger – his behaviour, psychopathology, his art. But it is her 4 part poem sequence plus coda on which I am going to focus – on Chevalier’s poetic animation of Henry’s life from childhood to death: his plights, conflicts, moods, his creativity. Chevalier uses a range of poetic forms and structures to give us the textures of Henry’s life and psyche. She gives him plenty of space to speak for himself through the monologue form which prevails through most of the narrative. Drawing on art critique, critical biography, Darger’s writings including autobiography, and her own empathetic, astute, and inventive imagination Chevalier has produced a rich, feisty, and evocative portrait – without sensationalising, confining, or whitewashing her subject. In the coda Henry even appears and speaks from beyond the grave. This namelessness of his sister will cause him much sorrow, will haunt him. He will never be able to find her. The next poem ‘if we pray’ [for his father’s health, the discovery of his sister] introduces the role of God in his life, and his oscillating belief, doubt and anger at God’s treatment of him. This poem is the first of a number of list or litany form poems directed to, or dealing with God. These pleasures don’t last long. Henry travels to Chicago to see his godmother, but the visit is disappointing. This poem is aptly titled ‘the milk tastes of onions’. However she does find him a job in a Catholic hospital. Chevalier uses a rush of merged words, word clusterings, lists, and word play, in various texts throughout the sequence as devices to track the pulse and texture of Henry’s psyche. As a positive strategy Henry and his one friend, Whillie, make an altar to little Elsie in Whillie’s barn. It’s a touching yet fleeting moment. They celebrate with fairy floss and icecream. Soon though the shrine is destroyed, by ‘child haters’ according to Henry. God is in Henry’s bad books again! And then when Henry is called up for service in World War I, all 5’1” of him, he is soon sent home – the day after Christmas! – for ‘failure of limbs to support success in drilling’. He sure is a ‘child of woe’. Soon he’s back working at the hospital, and in his free time rescuing newspapers, comics, statues, spectacles from the trash can, items he will store in his room and use for his art. There is a fine image of these acquisitions : ‘a nest of warm newsprint fills a bony chair’. the blessing of siblings …………………………..
Chevalier further evokes Henry’s creativity in the poem ‘cloud cover’, cataloguing a variety of cloud images which drift across the page in spaced phrases. She also reveals more disturbing aspects of Darger. In ‘belladonna’ we see this through the voice of Violet, one of the Vivians, who speaks of ‘the other mr darger’, of a ‘fierce looking traitor’, ‘a scary raider’. Darger declares ‘i’ll festoon white coral bells/with the girls’ intestines’. In a dream prose narrative from Henry’s writings he displays some conflicting attitudes to a beautiful girl he first sees as having the form of a guardian angel. In a following short prose poem the word ‘girl’ is repeated in different scenarios often evoking anger, dislike, disappointment. Yet in another prose poem about materials he finds in the rubbish bin Chevalier makes him rhythmically playful: ‘olive oyl tinfoil sir/ arthur conan doyle’. By presenting these fissures, instabilities in Henry, Chevalier creates dramatic tension. Henry’s room becomes a vivid and animated theatre where Chevalier describes his illustrations and performances of the Vivians battling the Glandelinians – at the site of the battle of Jennie Richee. Henry declares ‘across my table a green gale blows a gate’. His room, the world outside, and his imagination conflate. In the poem ‘elemental warfare‘ a 78 on his Victrola, intended to mask the screams of the Vivian girls, fails the task. The girlfriend of a lodger thinks he has friends with him. Henry tells her no one is there. It is touching to see solitary Henry later call the girls ‘friends’. This micromoment of social exchange is further developed in the beautifully titled ‘the glossiest day’ where the landlord’s wife notices Henry’s artwork after changing a light globe for him – ‘Why you’re a good artist, Mr Darger!’ It’s an affirmative moment. Later Henry gives her some food scraps for the dog, having gruffly referred to her as a ‘jap’ earlier in the poem. But this sense of wellbeing is again fractured in Henry’s incantatory lament ‘too late’ where Henry is upset with the lack of fruition in his life. Another bad mood with God – ‘i cannot leave my girls to him’. After the frail Henry is taken into care at the Little Sisters of the Poor house the narrative reaches a dramatic climax, when David the lodger, and Mr Lerner, the landlord, discover the treasures of Henry’s room. This significant moment feels like both a violation and a blessing. Chevalier’s use of plain, down to earth language by the 2 men creates an ‘in your face’ edge rather than a tone of reverence. We see images of objects, which at first seem to be junk. They carry down painting materials, colouring books, collapsed cartons etc., but when gusts of wind blow papers from a box they see the ‘escaped’ drawings, and Chevalier writes ‘the truth breaking in upon them’. ‘shee-it, chicks with dicks’ exclaims David; Lerner, the photographer replies ‘far out!’ – but also notes Henry’s skill with composition and colour. And so Darger’s works are saved – taken back up to his room. The last poem of this section, set in the poor house, is a reckoning of Henry’s life, in list poem form, where the phrase ‘no room’ is repeated. The first line reads ‘henry joseph darger is allocated one bedside table’. Henry has been stripped of his creations, and of course God had failed him – especially for not finding him a child to adopt. The instruction ‘limit yourself to an eraser’ is a sharp and unsettling image. this shrink -e – dink’………. this fraud pried and probed…….. The 2nd poem where the poet narrator meets the revenant Henry on a beach in 2010 is a cheeky Chevalier creation – I’ll leave you to enjoy it yourselves when you buy a copy of this remarkable book. This entry was posted in Darger: his girls, Issue 6, joanne burns, Julie Chevalier, Puncher & Wattmann and tagged Annie Aronburg, Elsie Paroubek, Henry Darger, John M MacGregor, lincoln’s asylum, literature, the History of My Life, The Story of the Vivian Girls in What is Known as the Realms of the Unreal. by Mark Roberts. Bookmark the permalink.